Filipino angler Jaime decided to include a days lure fishing Barramundi in his Thailand holiday schedule. 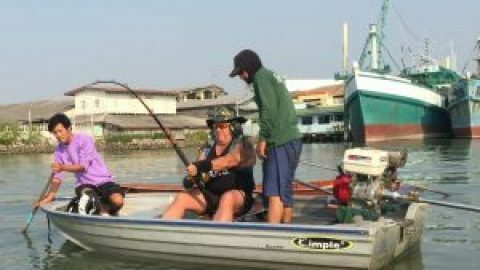 After travelling a short distance from Bangkok the angler soon arrived at the Barramundi ponds fishing complex and began to cast his lure into the fishing ponds in search of the Barramundi. After only a few casts the anglers lure was grabbed and a good sized Barramundi threw itself out of the fishing pond in an attempt to spit out the trebles. With the light weight spin fishing rod bent over almost double the Barramundi proceeded to embark on a series of wild acrobatics for several minutes before being brought to the grassy bank. 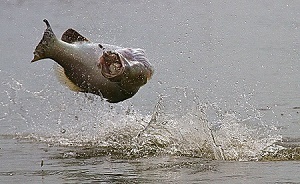 The Barramundi was estimated to weigh 3.5kg’s and was quickly released in readiness for the next strike. Further casts into the same fishing pond resulted in more strikes from the Barramundi which fought equally as hard as the previous fish. With a lull in the action Jaime moved onto another adjacent fishing pond and was soon connected with another Barramundi. Jaime continued to move between the adjacent Barramundi fishing ponds catching from each pond on most casts. Changing the pattern of his lures also helped him stay in contact with the Barramundi which continually obliged the angler by striking at his lures on a regular basis. As the days Barramundi fishing continued the angler started to land slightly bigger specimens with several Barramundi pushing the 5kg mark being landed from one of the quieter fishing ponds on the far side of the fishing complex.